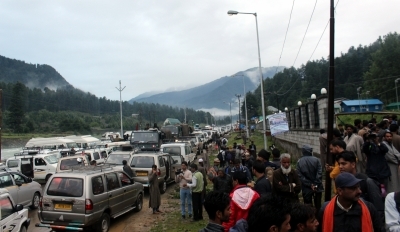 Jammu, July 20 (IANS) A fresh batch of 1,877 pilgrims left Jammu for the Kashmir Valley on Thursday to perform the annual Amarnath Yatra. “Another batch of 1,877 yatris left Bhagwati Nagar Yatri Niwas at 3.30 a.m., in an escorted convoy of 60 vehicles,” the police said here. Over 2.25 lakh pilgrims have reached the shrine located at 3,888 metres above sea-level since the 40-day yatra started on June 29. It will end on August 7 on Shravan Purnima coinciding with the Raksha Bandhan festival. The cave shrine houses an ice stalagmite structure that waxes and wanes with the size of the visible moon. Devotees believe the ice stalagmite structure symboliSes mythical powers of Lord Shiva. So far this year, 48 pilgrims have lost their lives.